The Complete Pest Control Service Provider. Is this a one time service call or would you like to start on a recurring basis? Common pests included in typical service are: ants, earwigs, silverfish and beatles. Select additional pests you wish to control. Common pests included in typical service are: ants, earwigs, silverfish, and beatles. Select additional pests you wish to control. Our service days are Monday~Friday, excluding holidays. Is there a time that you would prefer for us to arrive? We will try our best to accommodate your request. If this specific time is not available we will work with you to find an acceptable alternative. The larvae (grubs) develop in the dying plant and infect other hosts nearby. 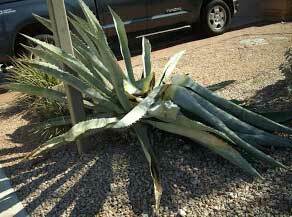 Agave snout weevil also infests the canes of several Yucca species. Control of the agave snout weevil is difficult. Selecting species that are less susceptible and typically smaller than the century plant is helpful, especially in areas where the problem has occurred previously. With rare or special specimens, chemical prevention using a broad-spectrum insecticide applied in spring is often effective in reducing damage. Several soil-borne pathogens including a species of the bacterium Erwinia and the fungus Fusarium have been impli¬cated in root and crown rots of agaves. A disease is usually in concert with infestations by the agave weevil, and currently, it is thought that weevil feeding enables these pathogens to enter and cause disease when they normally would not be pathogenic on healthy plants. See the section on agave weevil for more information on this insect vector. Other than preventing wounds in the plant, such as those caused by the agave weevil, there is no control for the bacterial and fungal infections once the microbes have entered the plant. Following mating a gestation period of approximately 22 days the female gives birth to an average litter of 4 to 8 pups. The average lifespan is considered to be 1 year however the environmental conditions will also determine the length of life. The Roof rat is a medium size rat with the average adult 16 inches in length from the nose to the tip of the tail and it weighs 5 – 10 oz. The Roof rat’s tail is longer than the body. The typical pelage color is black or nearly black with a grayish belly. The Roof rat has large ears and large eyes along with a pointed nose. The Roof rat is most active at night. Not only will it establish its nests in the dense vegetation but will also move above such as attics by entering through vents or structural gaps. They move quickly and quietly along fences and utility lines as well as shrubbery and trees. Limbs growing close to the dwelling will be an opportunity for the rodent to travel in the quest to gain access. Exterior nests may be found in the dead palm fronds of an unmanaged tree. Roof rats at times will build leafy nests within trees similar to squirrels. Peak foraging and feeding periods occur at dusk and again prior to dawn. When food is abundant, Roof rats may feed in family groups of up to 10 individuals. A Roof rat’s diet consists of more natural foods thus being a bit more independent than the Norway rat however they will be inclined to partake of an opportunity. When available Roof rats will consume Slugs & Snails as well as cockroaches such as the American roach. Roof rats require water on a daily basis, 1-2 oz. in a 24 period. Roof rats will take advantage of the most any situation: raiding a dog’s food, garbage cans, overgrown citrus, bird feeders and just about anything that will prove to be a meal. Home range of the Roof rat in is estimated at 25 – 100 foot radius from the nest. But the specific environment dictates the home range of most rodent families. Rats living close to easily accessible food tend to have shorter home ranges. It would be considered common for the Roof rat to travel 300 feet from the nest while foraging however, rats living within a structure such as a ceiling void may go no further than 25 feet. Each site may pose numerous difficulties as well as types of control measures. Always remember, you have to be patient. Although there are numerous control measures as with other rodents I would say it is the preparation of the property. Trimming: Bushes, shrubs and trees. Keep the bushes and shrubs trimmed underneath so as to not allow ground cover. Also the vegetation growing on fences etc. The denser the cover the better the opportunity to move as well as nest. Tree limbs within 3 feet of the structure allow aerial entry points. Keep trees trimmed back away from the structure. There are products on the market that are manufactured with different components such as steel wool that will assist in proper rat proofing. All possible areas of entry should be addressed. Mechanical traps are effective however must be closely monitored, emptied and reset. Glue Traps are a very effective tool, proper placement and monitoring will increase effectiveness. Bait boxes are very useful when attempting to control a larger population or an ongoing issue. Always remember to inspect regularly but not too often and replace uneaten bait with fresh uncontaminated bait to insure continued feeding. As with all other rodents sanitation is a very important piece to the puzzle. This includes but not limited to removing debris that creates harborage, proper storage and or removal of anything that may be consumed, periodic cleaning to remove urine & grease staining left by traveling rodents. Numerous baits & traps are available on the market however in the past few years many types of bait used by the pest management professional have become unavailable to the retail market. For this reason you may be best served contacting a local professional. Remember, Sanitation and maintenance!! This may not kill the rats but when they are no longer comfortable they will have a tendency to move to a more suitable location. Sorry neighbor. The House Mouse may be identified by its small slender body. The ears are large and the tail is semi naked. The tail is as long as the body and head combined. An adult will weigh .05-1.0 oz. The pelage may be dark gray with the underside being a light gray however color may vary greatly. Although sometimes confused with a young rat, the mouse has a head and hind feet that are considerably smaller than that of a young rat. Following mating, a gestation period of approximately 19 days, the female gives birth to an average litter of 4 to 7. The pup’s eyes open at 7 – 10 days and they are covered with fur. Young mice reach sexual maturity in 5 – 8 weeks. It can be somewhat difficult to put the Home Range into a defined set of variables. The reason for this is these furry critters are very adept at survival; the sheer desire to survive allows them to live within the confines of a pallet of sustainable product (9 sqft), or they may be forced to travel -yet distances don’t often exceed 50 feet from their home base. Most foraging will be from dusk to dawn with the heaviest feeding at dusk and again right before dawn. If living within a building that has light they may become present during daylight hours when all is quiet. Mice are opportunistic feeders; they have a tendency to eat cereals & grains. When we get to the actual working portion of a rodent problem unfortunately too many clients do not care for the advice. Why? Well a large portion of a problem comes from things such as clutter, debris and sanitation. Too many times I have seen these problems in such a quantities that no matter the number of traps or the amount of bait, we would not be able to get it under control without a cleanup. I don’t remember the last time I found an infestation that was purposely caused. It happens a day at a time, all of the sudden we come to the realization that our surroundings have become overwhelming. Think of this, removing all the possible harborage will not only spruce up the property but will give the rodents less comfortable surroundings. When mice become stressed not only will they produce fewer offspring; they have tendencies to do such things as eat their own young. Awful you might think, I agree. Let’s just look at it this way, we tidied up the place and they’ve begun our rodent control program for us. Now it may be possible that our products will be able to finish the job. I have been to locations where bait was ineffective and the client was then unhappy with my service. Keep this in mind- the most effective baiting program will be one that utilizes not only the bait but quite possibly all the tools mentioned above. Sanitation measures are a valuable piece of this process. We wonder why the rodent doesn’t take the bait. Maybe they’ve the keys to the castle and they visit your pantry. Did you ever notice how something you don’t really care for becomes much more desirable when it’s the only option? Let’s reduce their options! I read where mice were found living in a hollowed out shell of a hard roll inside of bakeries after consuming the bread. One experiment demonstrated that 24 mice supplied with abundant food, water & harborage within outdoor pens multiplied into 2,000 mice in only 8 months. Norway rat (Rattus norvegicus): This rat is also known as the brown rat, common rat, house rat, barn rat, sewer rat, gray rat & wharf rat. The Norway rat is an opportunistic omnivore, feeding on people’s foods and wastes or utilizing the natural foods that are available. Some mature adults in established colonies may exhibit neophobic behavior and avoid traps, new bait containers and quite possibly new food sources that suddenly appear. Following mating a gestation period of approximately 22 days the female gives birth to an average litter of 8 to 9 pups however larger litters of 12 are common. The pup’s eyes are open at 9 – 14 days and are weaned 10 – 15 days later. Pups reach sexual maturity in8 – 12 weeks. Females may come into heat every 4 to 5 days and may mate within a day or two after a litter is born. In captivity a rat may live three or more years however wild rats have a considerably shorter lifespan with an average of 5 to 12 months. Most rats are killed by predators, other rats, people, or quite possibly die of disease or stress before a year old. The Norway rat is a fairly large rat with the average adult 16 inches in length from the nose to the tip of the tail and it weighs 12 – 16 oz. The Norway rat’s tail is shorter than the body. An identification technique used by many pest management professionals to determine between a Norway & Roof rat is to pull the tail over the body. The tail of the Norway rat does not reach beyond the ears while the Roof rats tail extends easily to the nose. The typical pelage color is grayish brown but can vary from pure gray to blackish to reddish brown therefore color should not be used as the sole method of identification. The Norway rat has relatively short ears and a blunt nose. The Norway rat is a ground dwelling mammal digging and constructing its nest within subterranean burrows. The impulse to begin digging a new burrow is triggered by the rat perceiving some protection. In part this comes from tactile feedback from the vibrissae. Rats often start new burrows beneath heavy or large rocks. Around buildings they may burrow under slabs or alongside foundations. Junk and objects lying on the ground may trigger digging of burrows as well. Norway rats may burrow anywhere however areas that offer protection (vegetation etc.) will be sought out. The burrow will be 2-3 inches in diameter with lengths varying between 1.5 – 6.5 feet with two or more additional bolt holes and a central den. Burrows rarely extend more than 18 inches below ground however rats may burrow 4 feet or more to get in and out of buildings. If areas are quiet and undisturbed, it may be common to see rats foraging throughout the daytime, especially juvenile and subordinate individuals. Rats consume approximately 10% of their body weight daily. Norway rats commonly collect and carry off foods to either be stored in nests or hidden areas or to eat in a less disturbed and protected location. Subordinate rats may be forced to feed from leftovers or from less nutritious or even possibly vulnerable areas than that of the dominate animals. Norway rats require water on a daily basis. Stressed or hungry rats will also attack and cannibalize other rats. Home range of an established Norway rat in urban areas is 25 – 100 feet from its nest. But the specific environment dictates the home range of most rodent families. Rats living close to easily accessible food tend to have shorter home ranges. Conversely, they will travel several hundred feet each night if necessary to acquire essential resources. Radio telemetry studies have demonstrated rats liberated in areas foreign to them were recaptured 4 miles from the point of release. These types of studies explain how likely it is for the Norway rat to follow various urban pathways for considerable distances and establish new infestations in previously uninfested neighborhoods.